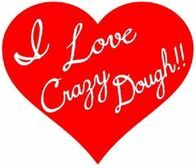 Nutritional Information - I Love Crazy Dough!! Nutrition labels are based on one container of Crazy Dough containing 18 cookie dough balls. 1 serving = 1 Crazy Dough ball.